“You never think something bad will happen to you, especially when you feel strong and healthy.” In 2008, this is what Marie Perez was thinking when she was diagnosed with Stage 3 breast cancer. A long-time resident of Miami, Florida, this retired pre-school teacher was totally devastated to get this dire news. 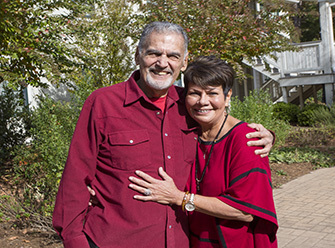 Yet, being true to herself and having the support of the love of her life, Frank, her husband of 40 years, and her children, she vowed to beat this awful disease that affects 1 in 8 women in the U.S.
Marie’s story is sadly not that uncommon. Initially told by her family doctor that everything was fine, she asked him to run more tests since she had a feeling that something wasn’t right. After a biopsy and an ultrasound, her doctor shared with her over the telephone that she had breast cancer. Her son told her that the best place for her to be treated was at UNC Hospitals. Forward one year. Since 2009, Marie and Frank have been periodic guests of ours. Their journey has been a long and complicated one. Marie has endured a mastectomy, reconstruction, chemotherapy, radiation, a lupus diagnosis, clinical trial drugs, a recurrence of the disease and several infections. Thankfully, she’s at a point in her treatment now where she and Frank make the drive up to Chapel Hill from Miami for follow-up visits every several months.